FlyVPN is a global VPN service, with its servers spread across 40 countries and a presence on every continent – it’s particularly strong in Asia. However, FlyVPN works out as poor value compared to some of the better-known VPN services, and your internet speeds can suffer while using it. FlyVPN’s focus is on unblocking websites and streaming services in countries where they might be blocked or censored, but it can also handle other common VPN jobs, like giving you a secure, encrypted connection when you connect to the Internet using a public WiFi network. As a result, you can surf the web with a higher degree of anonymity or, by connecting to a foreign server, access services that might be blocked in the country you’re connecting from. This can be useful if, say, you want to watch US catch-up TV services while you’re travelling outside the States. We won’t sugarcoat it – this isn’t one of the best VPNs around. Still, FlyVPN isn’t without merit. FlyVPN has some useful features hidden away in its advanced settings, like an option to exclude services in a specific country or work only when you’re connecting to a specific country. It’s fast to make the initial connection too. However, once you’re connected, speeds suffer. Onto the downsides, then. 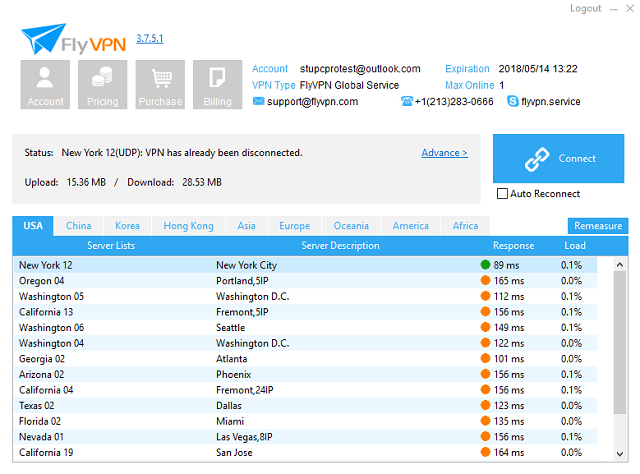 FlyVPN, unfortunately, comes up short compared to rival VPN services. Support is poor in comparison to other VPNs, and even the tutorials on the website are badly-formatted and sketchy. This matters, as the day-to-day ease of use for FlyVPN simply isn’t up to scratch, compared to most services. For instance, there are no obvious notifications to tell you when you connect or disconnect. The app doesn’t appear to support the standard OpenVPN protocol, just the older, less-secure alternatives. Crucially, internet speeds are pretty awful, both on short-distance and long-haul server connections. With the latter, we found speeds were often under 5Mbps, versus a normal connection speed is nearer 40Mbps. Finally, the level of privacy protection may not even be up to scratch. When we used the DoILeak.com website for testing, it picked up leaks that nearly every other VPNs we’ve tested successfully plugged. Further bad news – FlyVPN isn’t even particularly cheap, at $9.90 per month or $80 a year. And that’s for one device, only. You have to pay extra to connect further devices. When other, better VPNS can give you two years with 5 simultaneous connections for the same price that FlyVPN gives you one year and one, it’s hard to call it good value. FlyVPN is a bit of an odd VPN, and it does things differently from the moment you sign up. First, you have to enter your username and password, then go through a verification process by captcha code – where you type in the pictured letters – and email before you can even go through to payment. There’s no confirmation email once you’ve paid, leaving you to login to the website, find the VPN download page and download and install the Windows VPN app from there. The app itself is quite basic and not very user-friendly. It gives you a long list of the servers in each region, along with a percentage to show how much they’re being used and an indication of their speeds. Select one, then click the big, blue Connect button, and you should hook up. FlyVPN is slow, awkward to use and not reliable. Were it free or cheap, we’d be a little more forgiving. For these prices, you should definitely pick another VPN instead.